One of the big changes at the ABC Kids Show last fall was the disappearance of cribs with up and and down gates. Continuing improvements in safety can help cut crib deaths. Parents should not use any crib with missing, broken or loose parts. Make sure to tighten hardware from time to time to keep the crib sturdy. Crib slats or spindles should be spaced no more than 2 3/8 inches apart, and none should be loose or missing. Also NEVER use a crib with corner posts over 1/16 of an inch above the end panels (unless they’re over 16 inches high, such as for a canopy). Never place infants to sleep on pillows, sofa cushions, adult beds, waterbeds, beanbags, or any other surface not specifically designed for infant sleep. NEVER place the crib near windows, draperies, blinds, or wall mounted decorative accessories with long cords. When using a drop side crib parents and caregivers should check to make sure the drop side or any other moving parts operate smoothly. Always check all sides and corners of the crib for disengagement. Disengagements can create a gap and entrap a child. In addition, do not try to repair any side of the crib, especially with duct tape, wire or rope. Parents should be sure that hardware is installed properly. When assembling and disassembling drop side cribs, parents should always confirm that the parts are reassembled following the manufacturer’s guidelines as listed in the instructions. 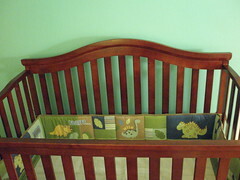 Always check all sides and corners of the crib to assure proper assembly with no openings that may entrap a child. The crib mattress should fit snugly with no more than two fingers width, one-inch, between the edge of the mattress and the crib side. Otherwise, the baby can get trapped between the mattress and the side of the crib. Do not try to repair any side of the crib without manufacturer approved hardware. Putting a broken side up against the wall does not solve the problem and can often make it worse. Many older cribs do not meet all current safety standards. Even if you are on a tight budget, you should not purchase an old crib at a garage sale or accept a hand-me-down crib that may not meet Federal and ASTM standards.